1977 Leyland Mini - This is interesting. 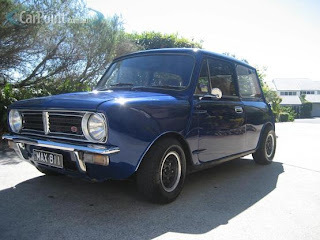 This is an Australian made Mini Clubman. It's different from UK made Clubmans in that it has external door hinges and front quarterlight windows. Click here to see the listing. 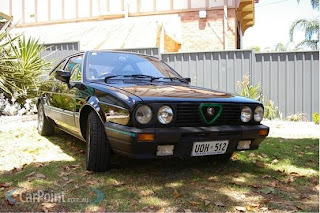 1986 Alfa Romeo Sprint Veloce - The Sprint was based on the Alfa Sud and later (like this one) the Alfa 33. It's FWD and has a flat 4 engine. Alfa Suds, 33s and Sprints rusted like no other Alfa rusted (and that's saying a lot). Seeing one in this condition is unusual. These are supposedly a lot of fun to drive, but since Alfa never brought them to the US, I've never seen one, let alone driven one. Click here to see the listing. 1994 Asia Motors Rocsta - Whoa! What the hell is this? This looks like what happens when a Jeep CJ mates with a Suzuki Samurai. From what I can tell, Asia Motors is now part of Kia. 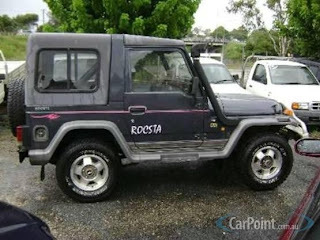 Asia Motors launched the Rocsta in 1990 and retired it in 1997. In 1998 the Rocsta's replacement, the Asia Retona, was introduced and sold under the Kia badge. Click here to see the listing. 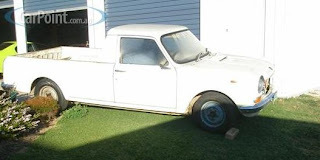 1968 Austin 1800 Mk I "Ute" - Wow. The Austin 1800 (BMC ADO17) was a car that never made it to the US. In England it was affectionately known as the "Land Crab". This particular model was never sold anywhere other than Australia. Yep, it's a pickup truck, or "ute" as they call them in Australia. I have to assume it has the Hydrolastic suspension which probably makes it a nice riding truck, but not practical for carrying heavy loads. Who cares? This is just a unique and really cool old vehicle. If I had the time and the talent to restore it and a space to store it, I'd bring this over to the US in a heartbeat. All of these listings come from a site called CarPoint.com.au. Be careful. It can be addicting.